Allois, a prolific Malibu surrealist, has had a busy start to the new year, with new works on display. On January 27, she participated in the CASA Wine + Art 2018 Charity Auction in the DTLA Art District Show and from Jan. 10-14, she was part of the LA Art Show 2018, curated by the bG art gallery. Allois showcased two works at the CASA Wine + Art charity event, including ”Marcy” from her Keepers collection, and 12 recent works at the LA Art Show 2018, including a commissioned portrait entitled “Virginia/Blue Dream”, depicting Virginia Argueta (Miss Universe 2016, Miss World 2017). 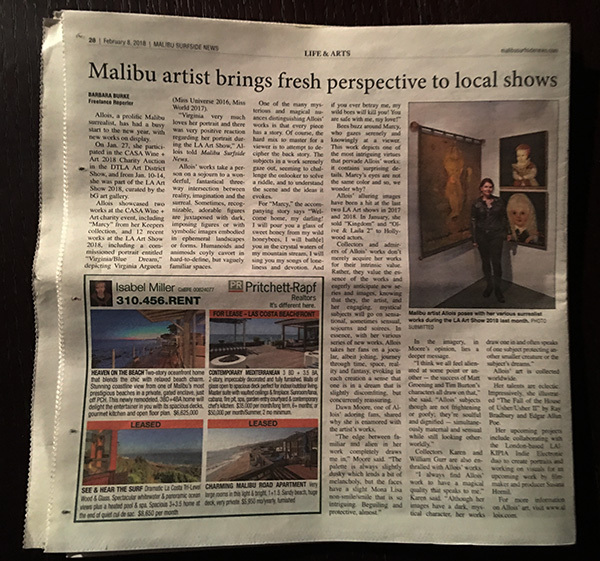 “Virginia very much loves her portrait and there was very positive reaction regarding her portrait during the LA Art Show.” Allois told Malibu Surfside News. Allois’ works take a person on a sojourn to a wonderful, fantastical three-way intersection between reality, imagination and the surreal. Sometimes, recognizable, adorable figures are juxtaposed with dark, imposing figures or with symbolic images embodied in ephemeral landscapes or forms. Humanoids and animoids coyly cavort in hard-to-define, but vaguely familiar spaces. One of the many mysterious and magical nuances distinguishing Allois’ works is that every piece has a story. Of course, the hard mix to master for a viewer is to attempt to decipher the back story. The subjects in a work serenely gaze out, seeming to challenge the onlooker to solve a riddle, and to understand the scene and the ideas it evokes. Bees buzz around Marcy, who gazes serenely and knowingly at a viewer. This work depicts one of the most intriguing virtues that pervade Allois’ works: it contains surprising details. Marcy’s eyes are not the same color and so, we wonder why? Allois’ alluring images have been a hit at the last two L.A. Art shows in 2017 and 2018. In January, she sold “Kingdom” and “Olive & Laila 2” to Hollywood actors. Collectors and admirers of Allois’ works don’t merely acquire her works for their intrinsic value. Rather, they value the essence of the works and eagerly anticipate new series and images, knowing that they, the artist, and her engaging, mystical subjects will go on sensational, sometimes sensual, sojourns and soirees. In essence, with her various series of new works, Allois takes her fans on a jocular, albeit jolting, journey through time, space, reality, and fantasy, evoking in each creation a sense that one is in a dream that is slightly discomfiting, but concurrently reassuring. Dawn Moore, one of Allois’ adoring fans, shared why she is enamored with the artist’s works. In the imagery, in Moore’s opinion, lies a deeper message. “I think we all feel alienated at some point or another – the success of Matt Groening and Tim Burton’s characters all draw on that”, she said. “Allois’ subjects though are not frightening or goofy; they’re soulful and dignified – simultaneously maternal and sensual while still looking otherworldly”. Collectors Karen and William Gurr are also enthralled with Allois’ works. Allois’ art is collected worldwide. Her talents are eclectic. Impressively, she illustrated “THE FALL OF THE HOUSE OF USHER/USHER II” by Ray Bradbury and Edgar Allan Poe, (Gauntlet Press 2010). Her upcoming projects include collaborating with the London-based LAIKIPIA Indie Electronic duo to create portraits and working on visuals for an upcoming work by filmmaker and producer Susana Hornil. Thank you all, my Hollywood patrons!